Wonder how Earth's surface water changed during the last 30 years? 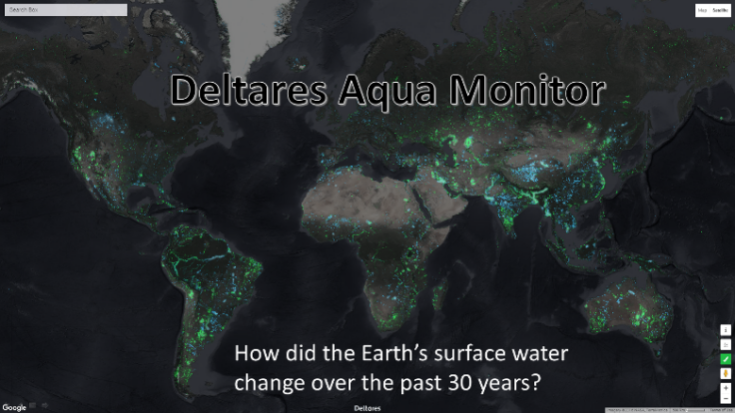 The Deltares Aqua Monitor detects these changes in real-time using satellite imagery for any place on Earth. Deltares has designed an open tool for analysing satellite data and visualising changes in land and water throughout the world. Conclusion: the world has acquired 115,000 km2 of water and 173,000 km2 of land in the last thirty years. The results were published in the journal 'Nature Climate Change'. The Deltares Aqua Monitor is the first instrument that operates on a global scale, with a resolution of up to 30 metres, to show where water has been transformed into land and vice-versa. It uses freely available satellite data and the Google Earth Engine, a platform for the planetary-scale scientific analysis of geospatial datasets that is now open to the general public.